Erm. Coffee is banned too? I wonder what the Biblical justification for that one is. Not sure what LDS texts are the source of it, but I don't think it's "Biblical" in the sense of Catholic/Protestant norms of "Biblical." Even if I could believe the rest of the hogwash the Mormons are selling, the caffeine ban would suffice to keep me out of the LDS. 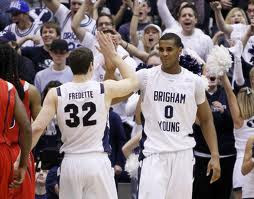 At any rate, with respect to Brandon Davies and BYU, it's important to remember that BYU's raison d'etre isn't to produce winning sports teams. You can believe, as I do, that BYU's principles are misguided, but it's silly to think they shouldn't abide by them. I guess I think BYU shouldn't abide by their principles, because they're misguided. That's how a certain value of 'should' works.